An Author a (Mon)day is an occasional feature on the blog where I invite authors to answer a few questions that I have for them. While this doesn't happen on a weekly basis, you can be rest assured that it always happens on a Monday. This week's guest is one of my favorite authors Diana Peterfreund. 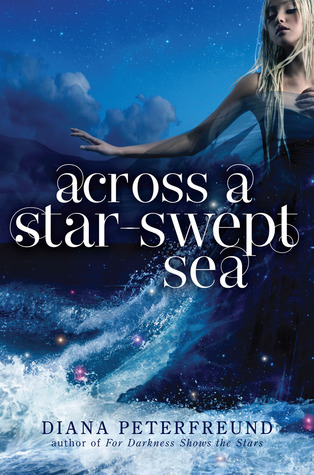 I first met Diana during the Teen Author Festival in March, where I got a chance to be one of the first to see a print ARC of Across a Star-Swept Sea and to gush about For Darkness Shows the Stars. I was happy to see her again at BEA, wearing an awesome ship hat, and just say hi. It's definitely an honor to have her here on the blog, so excuse me if I fangirl about it for a while! Alexa: Elliot and Kai are very well-developed characters. I know that they're obviously based on the characters in Persuasion, but did you draw inspiration elsewhere for them (like from real-life friends or celebrities, for instance)? Tell us about how you developed them. Diana: Thank you! For me, everything comes from character. I believe plot is what happens when you put a particular character in a particular situation. The story would not be the same with different people in it. You're right that the seeds of who Elliot and Kai are came from Anne and Wentworth in Persuasion. But obviously, they are very different, because of the time and place (and age) I've given them. Anne is more of a lady of leisure than Elliot is, more able to devote her time to reading poetry and other ladylike pursuits, whereas Elliot, out of necessity is a farmer and a leader. But their personalities are very similar. I was fascinated by Anne Elliot. I think she gets a bad rap among Austen heroines, as she's not as outspoken and sparkling as, say, Lizzie Bennet (who I adore - when I take those "which Austen heroine quizzes", I always get Lizzie Bennet). I first read Persuasion as a teen, and I didn't understand Anne, or even like her all that much then. It was only as I grew older and began to understand loss and regret that I fell in love with her. I wanted to explore her character, someone quiet and soft-spoken, but not at all weak. Both Anne and Elliot are so unassuming, but they have this marvelous moral compass and undying will, and it's extraordinary to write a heroine like that. Kai is very different from Wentworth, in large part because of his age, but also because of his upbringing. Wentworth is a military captain - he had the command of ships, of men, he led sea battles. Kai is, for all his accomplishments, still a teenager, so where Wentworth cane sort of keep his resentment of the past a bit under wraps, Kai has a stronger temper. Kai also has a very different background from Wentworth, who grew up in what was clearly a very well connected upper middle class family (his sister is married to an admiral!). He probably never worried about money, he was well educated, etc., and when he proposes to Anne, it's not an outlandish proposition. He had every reason to believe that with his intelligence, ambition, and connections, that he would soon become the rich captain he in fact does. Kai, on the other hand, grew up essentially a serf, scrabbling for any education, any resources. He doesn't have family to support him and help him. 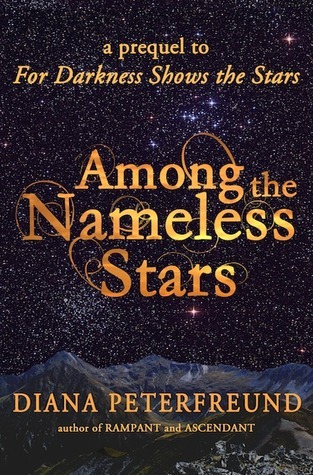 In order to make his way in the world, he literally has to run away from everything he has ever known - and go through some pretty rough times, too (as you see in the free prequel, "Among the Nameless Stars.") So that makes him a lot tougher, a lot more prickly, and a lot less of a "gentleman" than Wentworth is. Wentworth is part of the social order, and rises within it, whereas Kai kind of wants to burn it down, especially since he thinks it's what kept him apart from his one true love. But the inner core of nobility, of caring, and of seeing beyond the unassuming face Elliot presents to the world is part of his core. Alexa: I love both of them as well! In fact, if they weren't so cute together, I would be sorely tempted to steal Kai away... Okay, if you could slip into any book's story for a day (without being in any danger of dying or getting hurt), which book would you choose? Why? Which character would you want to be in it or hang out with in it? Diana: I think I'm going to have to go with the Narnia books here. I was one of those kids who'd try out the back of any wardrobe I found, just in case. I've always, always wanted to go to Narnia. And of course, when I was there, I'd want to hang out with my one true love, Edmund Pevensie. My love for Edmund is well-documented. I published a whole essay on it. Alexa: Narnia has always been intriguing to me, so I think it's awesome you'd want to visit! If you find a way, make sure I can come with you.... So, Persuasion inspired For Darkness Shows the Stars, while The Scarlet Pimpernel inspired Across a Star-Swept Sea. What other classic book adaptations would you want to do? And would they be set in the FDSTS world or in another one? Diana: I don't have any in the works, if that's what you're asking! (Alexa: It kind of was. In a subtle way.) Though I had the words "post-apocalyptic Persuasion" in my "idea file" for about a year before I figured out how to structure the world, the idea of a futuristic Scarlet Pimpernel has been rattling around in the same idea file for the better part of a decade. When I first came up with the concept, it was going to be an interplanetary caper. But the more I thought about it (I got a lot of emails last year asking me if I was going to do Sense and Sensibility next), the more I realized that it would actually work really well in the world I'd already built. I'd already laid the groundwork in For Darkness Shows the Stars. Andromeda and Kai spend a lot of time talking about revolution. Well, what if there was another society were all of that was coming to pass already? And then when I lit upon the idea of making the guillotine a sort of metaphor, where the revolutionaries were revenging themselves against aristocrats by making them "Reduced" - losing their brains rather than their heads, as it were - you were never going to stop me. Thank you SO MUCH Diana for dropping by the blog for a quick interview! It's truly an honor, and I loved the answers you had to all three of the questions I shot your way. I can't wait to dive into Across a Star-Swept Sea soon! It's fairly simple really - Diana's writing is gorgeous. She has a knack for telling her story in a way that's incredibly beautiful, and I fell in love with that in the first book. The series is very imaginatively developed, and inspires a lot of emotions -- and swoons. I also love that she was inspired by classic novels in the writing of each book! If you're looking for something that's a bit different, this series might be a good bet. I've got For Darkness Shows the Stars on my bookshelf right now! I REALLY want to read it now! Plus, I really love The Scarlet Pimpernel, and think a futuristic version sounds amazing! I need to hurry and read the first so I'll be ready for this new one! I adore Diana Peterfreund. I started her Secret Society Girl series and I'm in love with everything in it. Her writing is beautiful and extremely detailed. She really lays it out on the table. I admire that. And great interview! Persuasion is my favorite Austen book and I love the way that Diana Peterfreund reinvents the story. It's absolutely brilliant! I love, love, love the interview :) I've been pining over her books (For Darkness Shows the Stars is NOT in my library, sad face). I love her explanations of everything and I can't help but already mourn that no other books like her previous ones are in the works! There really should be a retelling of Sense and Sensibility out there...and Emma! Great interview, Alexa! 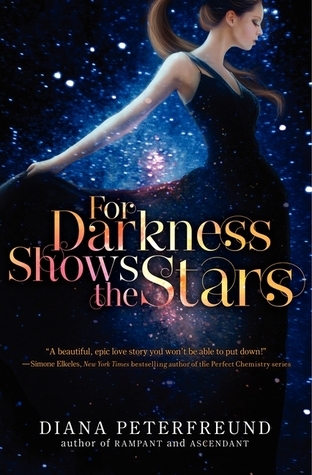 For Darkness Shows the Stars is one of my FAVOURITES! I was hooked from the first page! I have her unicorn books that I got for sale from Amazon ... I can't wait to read those. Diana really is a true talent! I loooved Narnia when I was a kid! For Darkness hows The Stars was one of my favorites of 2012. Loved it!! What an insightful interview! I love how much she loves Edmund, must read that essay one day. Who DIDN'T want to go to Narnia? TOTALLY cool that Diana wants to go to Narnia. I DO too, SO that works out nicely. I loved this interview with her - seeing how she thinks of her characters, and how she talks about how she always gets Lizzie in quizzes. That's awesome. As for other retellings, I'm a big fan of Clueless (Emma). There's definitely some sort of retelling for every Austen novel out there. Okay, I want to buy this essay she published! Seriously, Edmund... le sigh (even though he's only a kid!). Narnia made up my childhood... and adulthood! Great interview! LOOOOVE this interview and super jealous you got to meet Diana. You know how much I love her.